Mid-winter, we caught the ferry over to Vancouver Island for a quick get-away. Although brief, we really enjoyed our time over there, particularly in B.C's capital: Victoria. It's an elegant, charming city with an amazing food, drink and coffee scene. Staying mostly in the central downtown area, we found enough there to keep us occupied, and still leave us wishing we had a few more days. We enjoyed this quaint coffee bar so much, we went back for a second time. In central downtown, it was easy to find and get to. 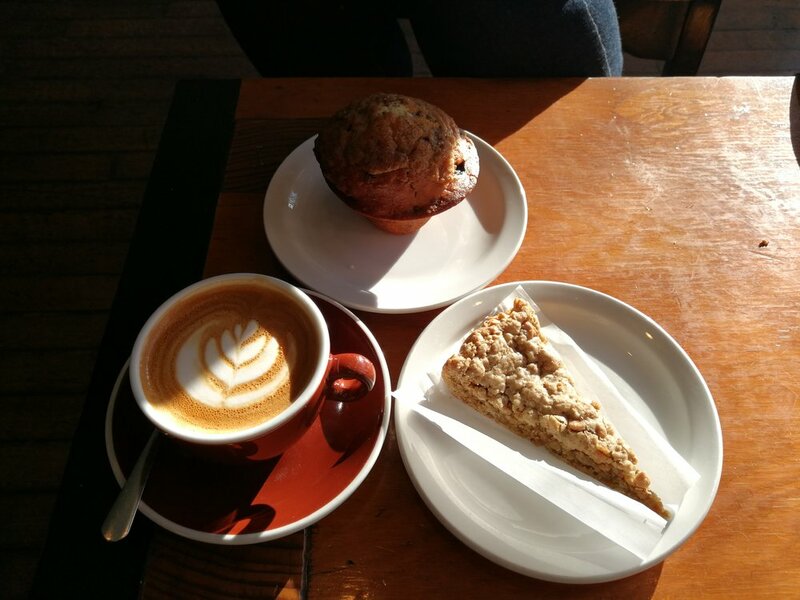 It seems like a place that would attract local regulars who appreciate good coffee. It caught a lovely amount of morning sun, and had a nice window-seat at the front, so we could taste, drink and enjoy the view. They had a small but varied selection of delicious pastries, with some unique flavours included. The coffee was very good! We arrived at this next place at the right time; it had started to snow. 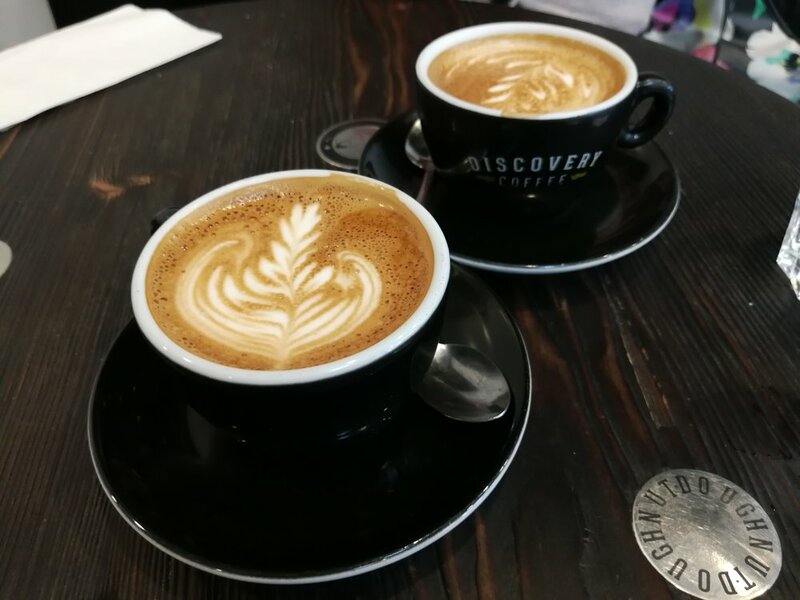 Having found it on-line, we were interested to taste what Discovery Coffee had to offer. They had a few locations, so it was easy enough to find one near-by. Inside, the space was very open, clean and minimal. It was well-suited as it was quite busy, but we managed to find a seat. They had a small cabinet for baked goods, but as it was later in the day, they had already run out. This was fine for us, as we weren't looking for food; just keep it in mind and get there earlier in the day if you want to try some of their snacks. The Cappuccinos we tried had a very good taste and texture. They seemed to really specialise in coffee, and also offered beans and equipment for at-home use. Overall, this spot wasn't an overly "cosy" place; but definitely somewhere to go for a solid, well-prepared coffee. Habit coffee was comfortable and relaxing. This felt like the kind of place where you could catch up with a friend, or chill out by yourself. It was in a restored, old-brick building, and had a rustic, open feel. Like Hey Happy, it managed to catch some glorious morning sun. As well as great coffee, they had a nice selection of baked goods to try. 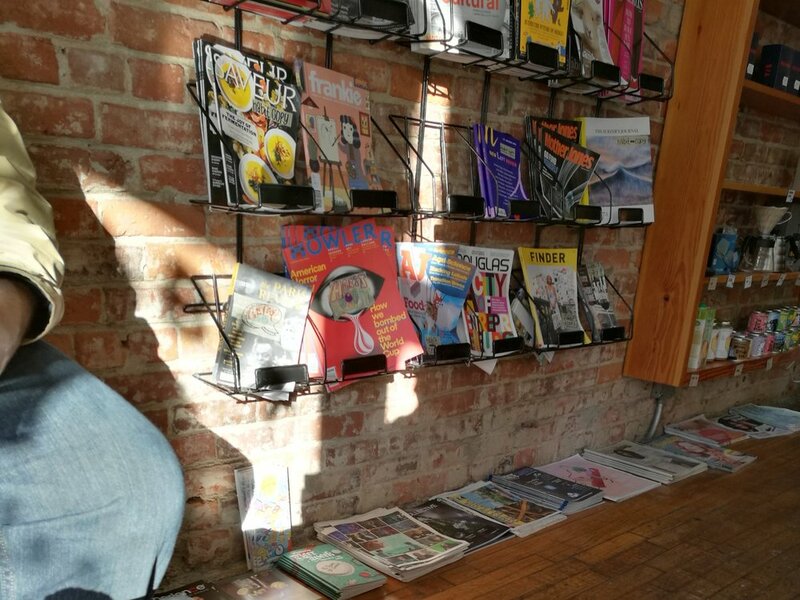 One thing that stood out, was their range of magazines to flick through while enjoying a cup of your favourite something. Our time in Victoria was brief, but enjoyable. There were still many places we wished we had time to check out. We'd love to head over there again, so if you know of any more great coffee spots we should try, let us know!